JUST A QUICK HISTORY AND HOW THE SLEIGHS WORK SO EVERYONE HAS AN IDEA. THIS IS NOT THE BEST PICTURE BUT IT WILL GIVE YOU AN IDEA ON THE OLD STYLE FREIGHT SLEIGHS. THE SLEIGHS ON THE CAT TRAINS WERE A BIGGER DESIGN THEN THE HORSE DRAWN SLEIGH OF THE PAST. A SLEIGH LIKE THIS WAS 9'X24' AND CARRIED 40 BARRELS OF FUEL. 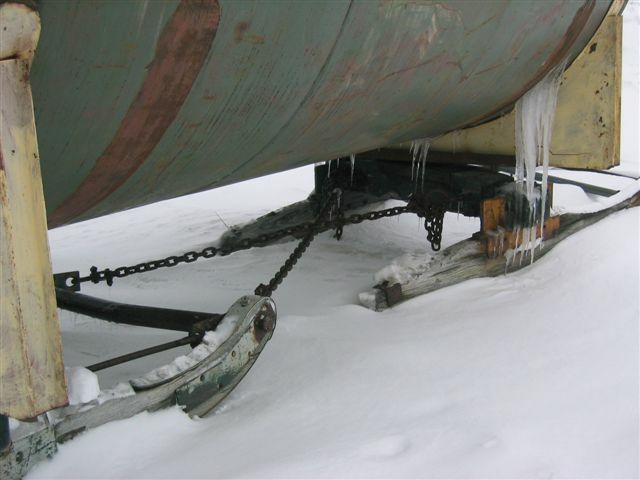 WHICH IS 10 TON PAYLOAD ON THE DECK OF THE SLEIGH AND THAT IS THE AVERAGE PAYLOAD FOR THE SLEIGHS IN FUEL OR DRY GOODS. 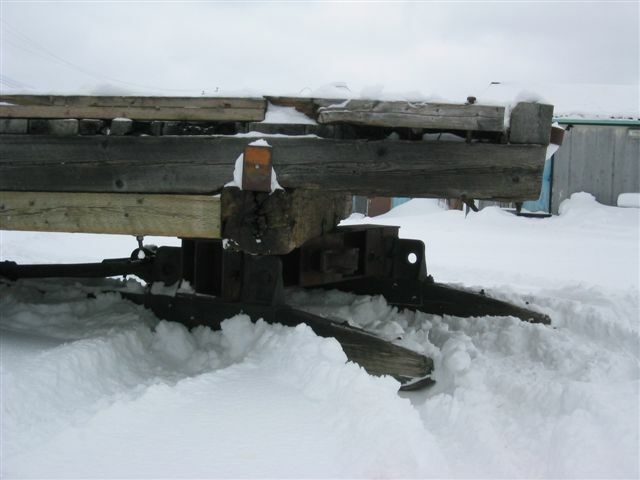 THIS IS ONE OF MY OLD WOODEN FREIGHTING SLEIGHS THAT I USED ON THE DOUBLE J ADVENTURES. THE OLD SKIS (SOME CALL THEM RUNNERS) WERE MADE OF OAK AND THEY HAVE LASTED 60 YEARS BUT NOT MANY MORE YEARS LEFT IN THESE ONES FOR SURE. I TOOK THIS PICTURE TO SHOW HOW THE CROSS CHAINS WORK. THIS IS THE KEY FOR THE SLEIGHS FOLLOWING IN LINE ON THE CAT TRAIN TRAILS. THIS IS MY ONLY WOODEN SLEIGH THAT I USE, I MAKE ALL MY SLEIGHS OUT OF SCRAP STEEL BECAUSE I CAN'T AFFORD WOOD. THE PICTURE SHOWS HOW THE FRONT SET OF SKIS TURN AND BACK SET TURNS TOO. FOR SOME REASON THESE SLEIGHS WERE CALL "BOB" SLEIGHS, BUT I HAVE NEVER KNEW "BOB" SO WHO IS "BOB", SO I CALL THEM "SKINNY SKIS" FOR THE WINTER FREIGHTING SLEIGHS. THIS WILL GIVE YOU AN IDEA ON THE REAR SET OF SKIS TURNING. 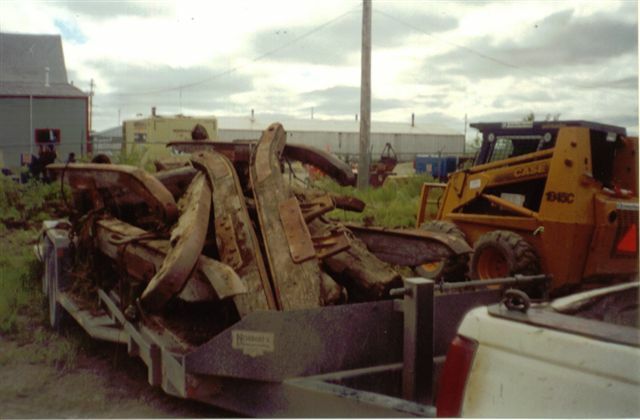 ONE TRAILER LOAD OF OLD SKIS, ONE OF THE BY PRODUCTS OF BEING THE SCRAP MAN IS I GET SOME GOOD STUFF IN WITH THE SCRAP STEEL. 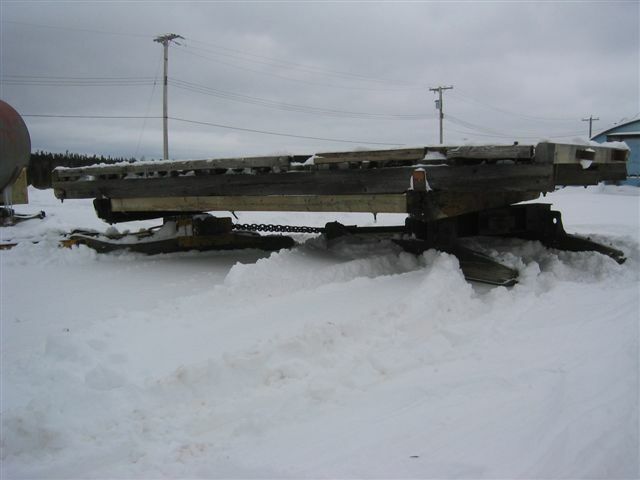 WITH A 100 OR SO SKIS AND SLEIGH PARTS IN MY YARD, I HAVE BUILT SOME NICE ALL STEEL "SKINNY SKIS" SLEIGHS. CLICK ON BELOW TO SEE THEM BEING BUILT.